Welcome to the bid information website of Projektlink Konsult Limited to host Kohacon 2015 in Ibadan, Nigeria. Nigeria is a developing nation and there has been a huge interest in Koha in Nigerian libraries in the past 5 years. Dozens of libraries are currently running Koha with several more in the process of migrating to Koha soon. This is quite impressive considering the fact that less than 10 libraries ran Koha over 6 years ago. Giving Ibadan, Nigeria a chance and opportunity to host Kohacon in 2015 will further help give Koha more visibility in the Nigerian / African library environment. It will also afford the local librarian community an opportunity to interact with the International Koha community members. This is also an opportunity for Librarians / Developers from other countries to see and interact with libraries / Librarians in developing nations like Nigeria and it will be an exciting cultural experience. We are bidding the 3rd time and we do hope we will be 3rd time lucky! 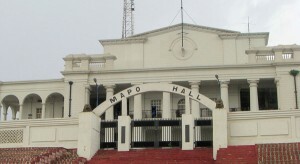 Ibadan, the capital of Oyo State is the 3rd largest city in Nigeria, after Kano and Lagos. It is an ancient city founded in 1829 and with a very rich cultural heritage. It is about 100km east of Lagos, the commercial nerve centre of Nigeria. It has a history of firsts, having the first university in Nigeria (University of Ibadan), the first stadium in Nigeria (Obafemi Awolowo Stadium), the first multistory building in Nigeria (Cocoa House) and the first television station in Africa (NTA Ibadan). Until 1970, it was the largest sub Saharan city in Africa. You can read more about the Ibadan City on Wikipedia. Projektlink Konsult Limited has been in the forefront of promoting the use of Koha and other open source software in Nigerian Institutions since 2000. We had the privilege of having installed (and upgraded twice) the longest running Koha installation in Nigeria. (Bowen University Library, Iwo installed with Koha 2.2.9 in 2007 now running 3.14). We have had several open house where librarians had a chance to learn about Koha first hand and also contributed to some of the previous Koha International conferences. Please find relevant information in the menu links above. We hope we have provided enough details needed for you to vote for us. If you require more information, kindly contact Tunji (tunjiadepeju (at) yahoo dot com) or Gbenga (gbengaadara (at) projektlinkkonsult dot com). We have noted concerns about the security in Nigeria, especially the Boko Haram issue and the recent abduction of school girls. The insurgency in Nigeria is restricted to the north eastern states of Nigeria which is over 15 hours drive from Ibadan, the proposed venue of the Conference. The proposed venue is also within a campus with a large community of expatriates, many of whom have been living in Ibadan, Nigeria for several years.